The only books I review are the ones I think everyone should read. Obviously, most of the books I read are books that I am interested in. But I promise, I have good taste. 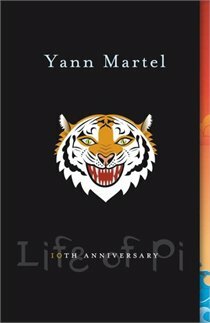 LIfe of Pi by Yann Martel was given to me as a Christmas gift by my boyfriend last year. He told me it was one of his favourite books and that I had to read it. I wanted to and had plans to read it as soon as possible, but it fell by the wayside. Then, one day, I was confined to the bathroom with an awful bug (too much info?) and in order to keep myself distracted from the illness at hand, I started reading Life of Pi. I couldn’t have picked a better time to start the novel, as there was no way in hell I could have put that book down if I’d tried. If you want a story like the one Pi described above, don’t read Life of Pi. Life of Pi changed the way I understand concepts like religion and survival for the better. The book is split into two very different parts. The first describes Pi and his discovery of religion, while the second tells the tale of a shipwreck and Pi’s very interesting and determined survival. Religion is always a touchy subject, especially among the devout. Everyone, even those within the same belief systems, have a different take on God, atonement, forgiveness, Heaven etc.. Martel challenges many of these beliefs in favour of a more unified view on religion. However, it is not a forceful novel that demands you see things from Pi’s perspective; instead, it reads like the words of an exceptionally wise man merely sharing his knowledge. Merely by telling his story, Pi convinces you that there is a better, more open-minded way of seeing religion. Pi asks: “If there’s only one nation in the sky, should all passports [religions] be valid for it?” Martel, p74. The second part of the novel I don’t want to spoil for you. This is the part that I heard most about before having read the book. In fact, I though the entire book consisted of this second part. You most likely know that it has something to do with a shipwreck, a tiger, a zebra, and an orangutang. But I won’t tell you more than that…except to say that Pi’s story of survival is truly a fascinating one. Normally, I say that I only do book reviews on books everyone should read. And that is somewhat true for this book as well. Everyone should read this book. 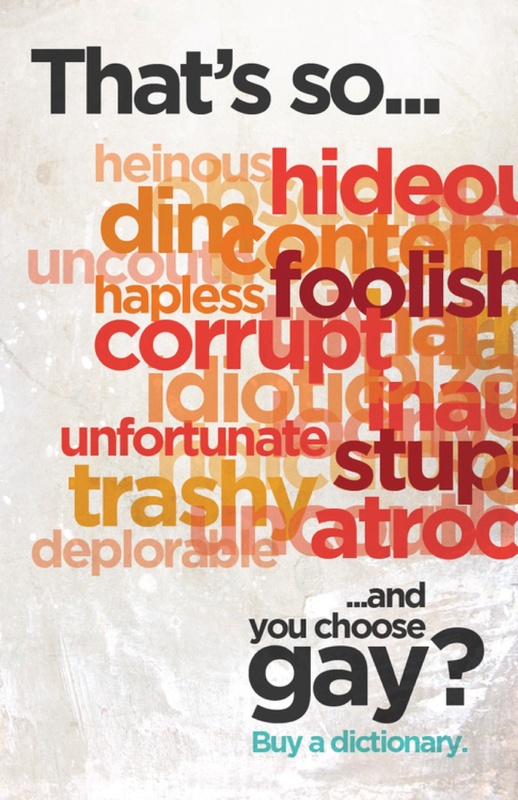 However, that is not to say that everyone can. It’s not a book that’s difficult to understand or hard to follow, but it is a deep book that requires reflection and challenging your personal opinion. Pi himself refers to his story as one that will make you see higher, further, and differently. That’s pretty accurate, I’d say. If you’re close-minded and/or stubborn regarding religion, you won’t like this book. Thanks for reading, folks! Let me know if there are any other books you’d like to hear a review on. Not much is happening in the world of university right now. But in preparation for some of my classes, I’ve been reading quite a bit lately. 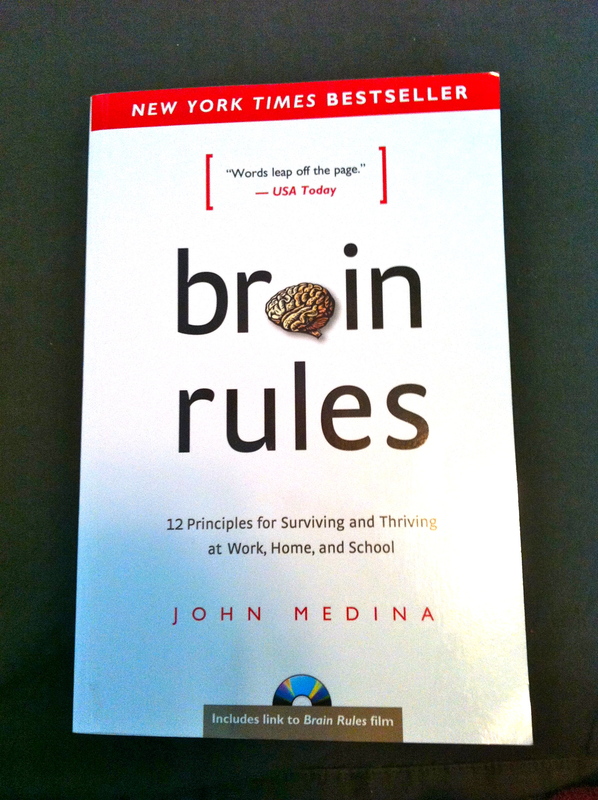 I recently picked up a book called Brain Rules by John Medina. I hadn’t researched it before hand and it was somewhat impulsive, but I quickly flipped through the table of contents and it looked like something I would really enjoy. I know I’ve said it before, but I doubt I’ll say it much more after this: I have found one of the greatest books ever written … on psychology that is. I can almost guarantee this book has significantly improved how I’ll function at university and in my future career. Medina shares with his readers the twelve “Brain Rules” (to the right) that he believes are the keys to thriving in our schools and businesses. Medina states in the intro that “for a study to appear in this book, … the supporting research for each of my points must first be published in a peer-reviewed journal and then successfully replicated. Many of the studies have been replicated dozens of times.” The scientists he sources are all at the very top of their field. If you commonly read books in the psychology section, you will recognize quite a few names. The topics Medina discussed cover most of the areas of how we learn, remember and forget, as well as how we can function at our highest in school or at work. His twelve different topics are very distinct, but he makes it very clear how they all connect to each other throughout the entire book. I have never read a book so utterly readable and easy to understand, despite the presence of complex and would-be confusing topics. Because Medina has made it his mission to understand how people learn and retain information, he has designed the entire book so that you will remember everything you’ve learned about learning. He’s witty, relatable, and not at all dry (not even when we got to the genes and chromosomes of the gender chapter). My two-year-old son Noah and I were walking down the street on our way to preschool when he suddenly noticed a shiny pebble embedded in the concrete. Stopping mid-stride, the little guy considered it for a second, found it thoroughly delightful and let out a laugh. He spied a small plant an inch farther, a weed valiantly struggling through a crack in the asphalt. He touched it gently, then laughed again. Noah noticed beyond it a platoon of ants marching in single file, which he bent down to examine closely. They were carrying a dead bug, and Noah clapped his hands in wonder. There were dust particles, a rusted screw, a shiny spot of oil…. I tried to get him to move along, having the audacity to act like an adult with a schedule. He was having none of it. And I stopped, watching my little teacher, wondering how long it had been since I had taken 15 minutes to walk 20 feet. In practice with how the brain learns, Medina has also created a short 2:00-5:00 minute video to go with each chapter, in order to help solidify what you’ve learned in the book. Here’s the video for the introduction. I hope I’ve sparked an interest in you to go out and buy your own copy of this book. No matter where your interests lie, I can promise you improvement in your school or work life if you read and apply Medina’s 12 brain rules. The enclosed special-edition book is your personal invitation to participate in our new Common Reading Program. This is your ticket to meeting new people, enjoying thoughtful and lively conversations about some bigger life questions, and joining a new community. The letter proceeded to suggest we (the undergraduates of the class of 2016) read the book before September. We can talk about the book over the summer via the designated Facebook page, and during our orientation week, we’ll be able to talk about the book with new peers, enter in an essay contest, and meet the author. It’s a great idea and I hope they keep doing it. Now, about this book. I’ll admit, when I saw the subtitle, Deep Forests, Big Timber and Life with the Tree-Planting Tribe, I thought the book was going to have a “Use less toilet paper! Stop buying books! Recycle everything!” message. But this book is not the slightest bit preachy. 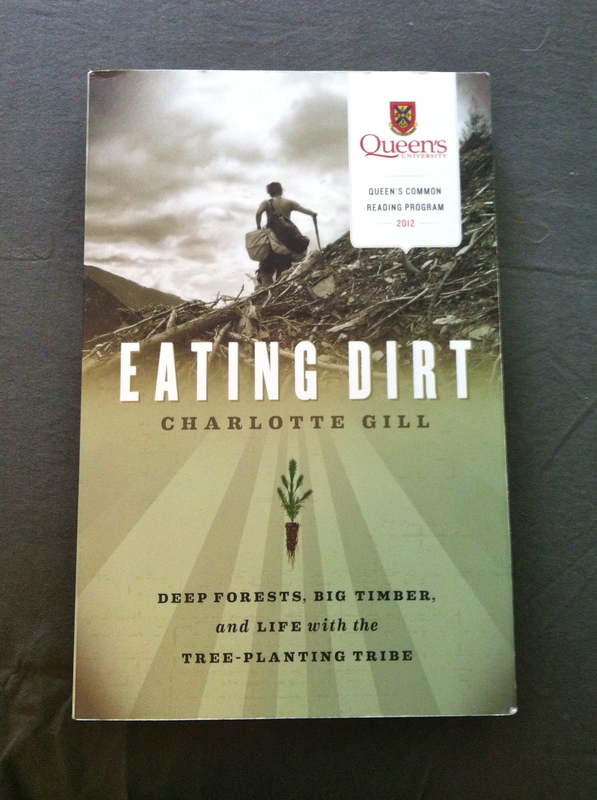 I never felt like Charlotte Gill was trying to change any opinions I may have about the environment or that she was commanding me to change my ways in favour of the environment. She opened my mind to a more environmentally-friendly way of being just by telling me her story. And the story of her trees. Home. It occurs to us for the first time, haloed in warmth and cleanliness. Our own beds. The twitter of the phone when it rings. Our girlfriends and boyfriends and spouses who say the whole world should recycle paper just so that we’ll run out of work, get laid off, and be forced to come home. And the children who are sometimes so young they can’t yet say how they feel. And the parents, who also lack the words. Bend, plant, stand up, move on. Brain above the heart, brain below the heart. And so on. I’m recommending Eating Dirt for absolutely everyone. (You’ll notice that ‘books everyone should read’ are the only ones I write reviews on.) Even if you laugh at the concepts of global warming and recycling, or the idea that we’re running out of resources, you will not be offended by this book. I’d love to hear your own thoughts on this book if you’ve read it. Please feel free to leave a comment with your opinion. And if you haven’t read this fantastic book yet, I hope I’ve encouraged you to get your own copy! Well, I’ll get right into it. In March, I mentioned a book called Quiet: The Power of Introverts in a World That Can’t Stop Talking by Susan Cain. As I’m sure you can guess, the book focuses on just how much our current society (knowingly or unknowingly) undervalues the quieter, reflective, less social personality types at school, in the workplace, and socially. Cain is so passionate about this subject—she’s an introvert herself who has been pushed into many extroverted roles in her life—and you can really feel it in her writing. She shares real stories of both introverts and extroverts, and through the most cutting-edge research in the field, illustrates the fundamental differences between the extroverted, introverted, and ambiverted among us. This book has floored me. Of course, I’m very interested in psychology, especially personality and evolutionary psychology, so I already knew this book would be interesting to me. But the more I read, the more I think: “Oh! If only my teachers had known this about introverts!” and similar trains of thought. This book isn’t something that only psychologists should read, or even a book that only introverts should read. Everyone should read this book. The socially extroverted person will learn a little more about his “shy” co-worker that just won’t share her fabulous ideas in meetings, and the quieter, studious teenager will understand why his peers talk as much as they do. If you are a person who, at any point during your day, has to interact with other humans, you need to read this book. Along with Quiet, there are a lot of illuminating books I’ve been reading lately in the psychology area. I’ve been out of high school long enough that I feel like I’ve forgotten how to learn, so that may be why I’ve been gravitating toward the non-fiction section lately. I want to write an essay or create a seminar on something I find really interesting, in order to remember how to research, write, and edit. So I’m looking for ideas, folks. I need a topic that lies anywhere between social psychology and neuroscience. I’ll pick one, work on it, and maybe even post it when it’s done.